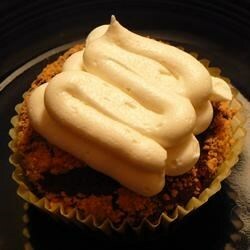 "Easy cupcakes with graham cracker, marshmallow and chocolate. The kids really love these." Divide batter evenly among paper lined cups, filling about 2/3 full. Place a chocolate kiss in each cupcake, pressing in lightly. Spoon 1 teaspoon graham cracker crumbs onto each cupcake. Bake at 350 degrees F (175 degrees C) for 18 to 25 minutes. Remove from the oven and top each cupcake with 1 teaspoon marshmallow creme. Dip spoon into hot water to prevent sticking. Return to oven for about 1 minute to melt slightly.